A classic, harmless landmark as you enter the city from the south? Far from it! 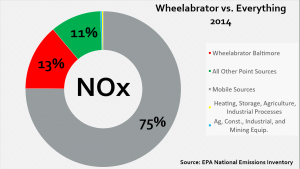 And from a climate change perspective, Wheelabrator is #1 in Carbon Dioxide emissions, releasing 783,674 tons of CO2 equivalents in 2016, according to EPA. This is 50% of the industrial greenhouse gas emissions released in the city! Lest these mercury and lead numbers sounds low, recognize that there is no safe dose of these toxic metals. Lead emissions from Wheelabrator have totaled around 10,000 pounds since the plant started in 1985. This is a shocking amount of lead pollution! To put the 53 pounds of mercury per year in perspective, mercury is one of the toxic pollutants for which there is no known safe level of exposure. This isn’t not counting mercury which gets into the air and water via the ash dumped in the city. A highly cited Minnesota study found that if approximately one gram of mercury (the amount in a single fever thermometer) is deposited to a 20-acre lake each year from the atmosphere, this small amount, over time, can contaminate the fish in that lake to the point where they should not be eaten. 53 pounds is 24,040 grams. That means the incinerator, in a typical year, is releasing enough mercury sufficient to keep over 24,000 20-acre lakes so contaminated that the fish are not safe to eat. How much is this impacting the Chesapeake Bay? But how can this be? Most days, you never see anything coming out of the smokestack. This is because Maryland law states that incinerators cannot release visible emissions. People usually don’t complain about pollution if they can’t see it, so Wheelabrator’s impact, ironically, is out-of-sight, out-of-mind. But what do those rankings really mean? One of the best ways of understanding how impactful Wheelabrator’s emissions are is to compare them to mobile emissions and other sources. So how does Wheelabrator stack up against other sources? Let’s start with nitrogen oxides (NOx). Once more, NOx is a pollutant that triggers asthma attacks and increases the lifetime risk of heart disease and stroke. We made a graph comparing emissions from every source that emits NOx using data from 2014 – the most recent data available. What this graph shows is that when you combine all mobile sources, they release 75% of the NOx in Baltimore’s air each year. But Wheelabrator, one smokestack, puts out more than NOx than every other stationary industrial source (“All Other Point Sources”) of pollution in Baltimore City combined. Well, that looks a little different. The green section is “Onroad non-Diesel Light Duty Vehicles” – what a mouthful. Think of those as the typical Toyota Corollas, Nissan Sentras, and Chevrolet Impalas (Dante’s car). The “Onroad Diesel Heavy-Duty Vehicles” are things like the big 18-wheelers you try to avoid as they come off the on-ramp. “All Other Mobile Sources” are special types of cars/light trucks/SUVs. 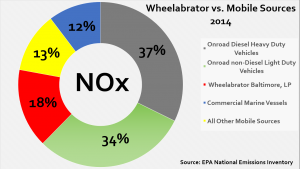 The graph shows Wheelabrator’s NOx emissions are so large, closing the facility would be equal to taking over half the cars off Baltimore’s roads, or just under half the long-haul trucks off Baltimore’s roads. Whew, what a polluter! Let’s talk another pollutant now: sulfur dioxide (SO2). That’s quite a difference! 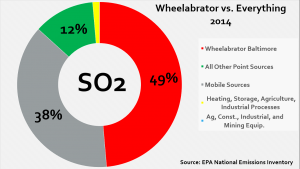 Wheelabrator’s SO2 emissions are almost half the total SO2 emissions in the entire city. Wooooah. That is insane. First, you can see that cruise ships (among other vessels) aren’t as wonderful as they may seem (and the viruses probably prove that too.) 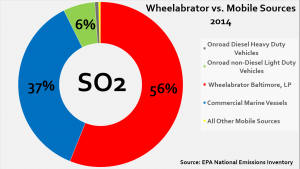 But if we’re talking cars and trucks, Wheelabrator’s SO2 emissions are 8 times worse than all the trucks and the Corollas, Sentras, and Impalas combined. Let me say that again. 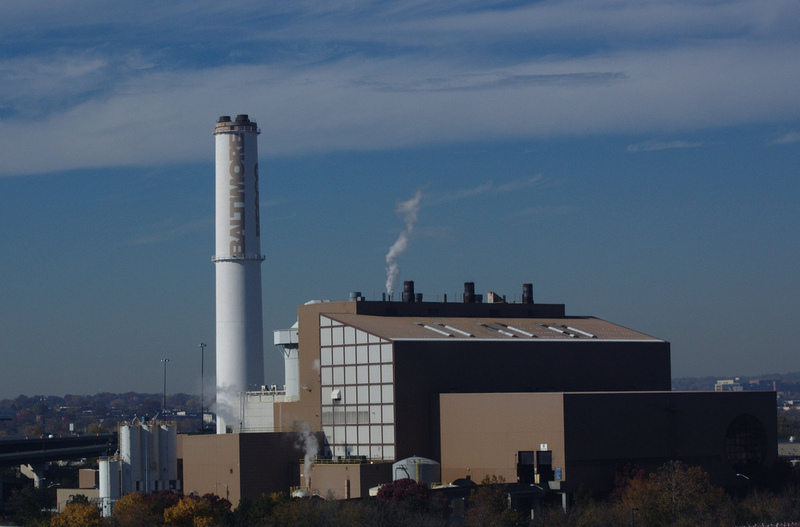 Every year, Wheelabrator’s ONE smokestack puts more sulfur dioxide in Baltimore’s air than all the cars and trucks on our roads EIGHT TIMES over. Something has to be done, and that something is shutting down Wheelabrator once and for all!